The casino is the one that funds the banker hand. 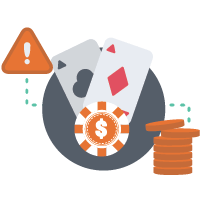 For example, the banker has funds of $1,300, which means that if one player wants to make a $600 bet on the banker, a second player can bet the rest $700. If a player wants to cover the entire banker bet, he has to say “banco”, and the entire bet will be his. The commission for the banker bet can vary between four and five percent, which is charged only if it is a winning bet.